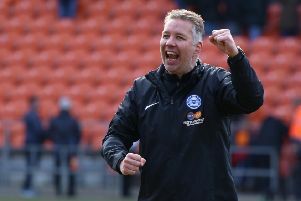 Darren Ferguson is back at Posh on Saturday. Darren Ferguson will try and treat his return to London Road on Saturday (October 24) as ‘just another game’. Ferguson is back at the ABAX Stadium, as the recently-appointed manager of Doncaster Rovers, for the first time since his sacking by Posh chairman Darragh MacAnthony in February. Ferguson was out of work for eight months after his dismissal, but he chooses to remember the good Posh times over the bad. “I had good times there. Really good times there over seven years,” Ferguson said. “We had a couple of years in the Championship, we won three promotions and we won the Johnstone’s Paint Trophy at Wembley. They were great times. “Obviously last season didn’t go well, but that can happen. I’m looking forward to going back. There are a lot of good people there. “I know it’s a cliche but it’s just another game for me. “I’m not really going to over-think it. Posh handed Ferguson his first managerial post in January 2007. It was a left-field appointment by MacAnthony that delivered back-to-back promotions and a first season of Championship football for 15 years. Ferguson left London Road in November 2009 with Posh bottom of the Championship, but returned in January 2011 to steer Posh to promotion from League One for a second time. No other Posh manager has overseen three promotions. No other Posh manager has ever won a cup final at Wembley. Posh were cruelly relegated in dramatic circumstances in May 2013 and have yet to recover. Ferguson’s magic waned and he was dismissed after a terrible display and a 3-0 League One defeat at fierce rivals MK Dons. Ferguson has already returned once to London Road as an opposition manager when his Preston side triumphed 1-0 in a Championship fixture in January, 2010 against Mark Cooper’s Posh. Ferguson won his first game in charge of Doncaster, 2-1 at Shrewsbury, to steer them out of the relegation zone. Rovers arrive at the ABAX, seven places and four points behind 13th-placed Posh. Ferguson has a fan in current Posh manager Graham Westley. “Darren’s achievements at Peterborough were enormous,” Westley stated. “The chairman and others at the club still hold him in high esteem and that is only right. “I know from personal experience how hard it is to win back-to-back promotions. You have to be a special manager to achieve that. “It’s hard to predict how football fans will react, but Darren certainly deserves a good reception. “I expect he will be feeling quite strange about coming back, but he will be professional and he will doubtless have Doncaster well prepared to face a club that he knows well. The last time Westley opposed Ferguson at the ABAX Stadium the current Posh boss was victorious as his Stevenage side won 1-0 in a League One match in 2013.